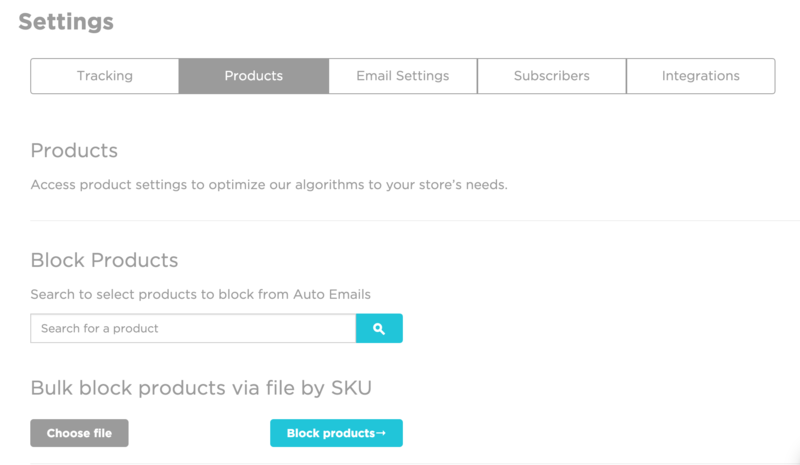 If you'd like products not to be included in your product recommendation emails, you can easily block them with SmartrMail. You might want to do this if you have test products on your store or still have items listed that are old. Follow the few steps in this article to block these products from all product recommendation emails. Access your Settings page from the dropdown menu underneath your store's name on the homepage. If you want to exclude a specific list of products, then you can also upload a CSV file of the products' SKUs beneath the search bar. All currently block products will be listed on this page.